Many people enjoy South American Native American art and jewelry. Some examples include the elegant turquoise and coral squash blossom necklaces the Zuni craft and the Kachina dolls and intricate baskets the Hopi craft. Many of the patterns and symbols on these objects are exceptional and familiar to many collectors today. The wistful figure of the Kokopelli flute player adorns many jewelry pieces and memorabilia. The history of Kokopelli makes fascinating subject material. Kokopelli captures the imagination and awe of people who enjoy art and culture. Ancient cultures carved and painted the flute player into rock walls and boulders long ago. The history of Kokopelli goes back 3000 years to the first carved petroglyphs. The Anasazi established him as a deity. The Anasazi were ancient Pueblo people centered in the present day Four Corners region in the Southwestern United States (Colorado, Arizona, New Mexico and Utah). His true origins are unknown. Kokopelli, whom the Hopi, Taos and Acoma indigenous people still revere, takes his place as a popular figure in history. The Hopi consider him a symbol of fertility. He often appears hunchbacked and in dancing poses. He plays a flute in Native American depictions. Legends portray him as a prankster, healer and story teller. As a sacred figure to many Southwestern Native Americans, he shares a connection with music, dance and mischief. He often displays Casanova-like tendencies. 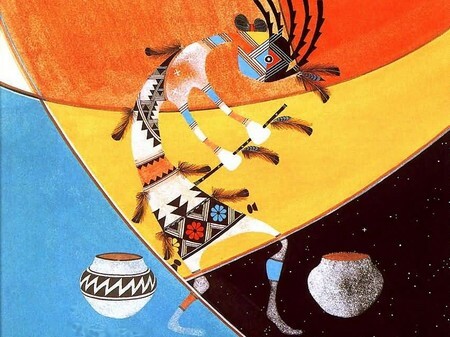 Many fascinating myths surround the story of Kokopelli. Storytellers say that long ago he went from village to village, turning winter to spring. The melody from his flute caused this transition. The flute was heard in the breeze and brought warmth. He could also melt the snow and bring rain to aid the harvest. Some said he had a hunchback because of all the seeds and songs he carried with him. Another legend states human conception comes from Kokopelli. According to legend, if he sings and dances in the night, the next morning all the young ladies in the village will conceive a child. Pueblo myths depict him as a seducer who carried seeds, babies and blankets to maidens in order to gain favor with the ones he desired. Ten centuries ago the Hohokam (Arizona Pueblo) painted Kokopelli’s image on ceramics. This became the prototype for his likeness in modern representations of him. Modern artists often depict Kokopelli wearing a kilt and a sash. His flute is actually a nose flute and resembles a clarinet.